If you have ever watched an old time western, or a more recent science fiction movie like Ironman, then you may have seen where we have been camping. Because of their unique formations, photogenic quality, and dramatic High Sierra backdrop, the Alabama Hills near Lone Pine, CA, has long been a favorite location for Hollywood producers of Western movies. Old, old time stars like Gene Autry, Hopalong Cassidy, Randolph Scott, and the Lone Ranger rode these hills in their adventures. Science fiction films made in the Alabama Hills include, “Screechers,” “Tremors,” and “Iron Man.” “Foreign-based” films such as “The Charge of the Light Brigade” and “Gunga Din” are among the 700 plus movies filmed in the Alabama Hills. 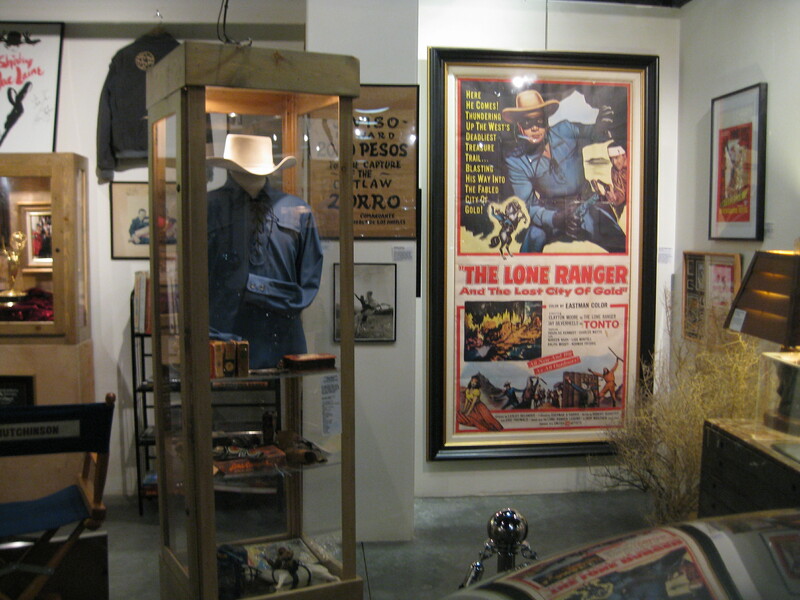 Lone Pine is home to the Lone Pine Film History Museum, where you can see a brief movie that highlights the film-making history of the area. 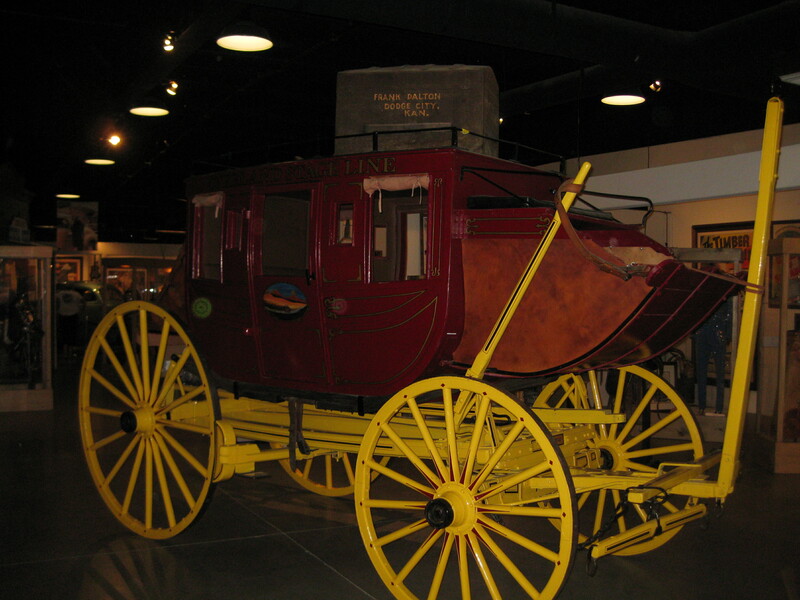 Over 10,500 square feet of exhibits and displays gives you an insight of this unique American cultural heritage. We camped at Tuttle Creek Campground, which is operated by the Bureau of Land Management (BLM). Tuttle Creek is in the middle of the high desert right next to the Alabama Hills. 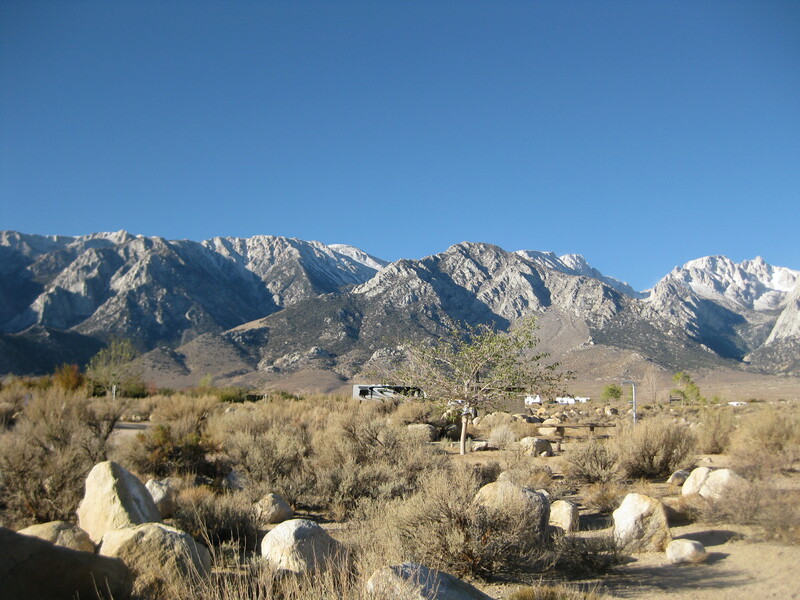 The Alabama Hills got their name from Confederate sympathizers who prospected and mined the area during the Civil War. In other words, there was not a lot of shade. When we left our last site, June Lake, there was snow on the ground. The 2,000 foot drop in elevation did wonders for the temperature. It was much warmer here, and the view was outstanding! What a sight to wake up to in the morning. The next morning we drove to the Interagency Visitor Center. 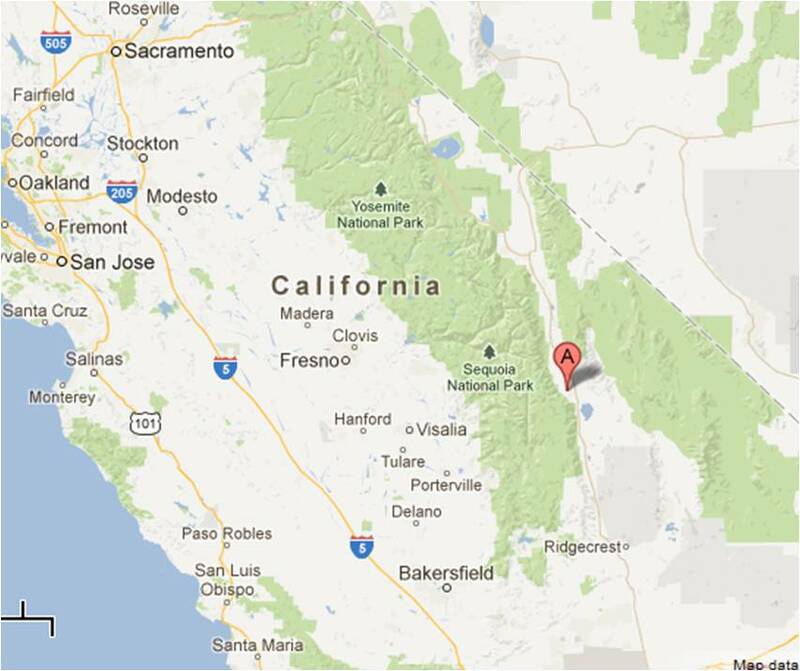 There we discovered another instance of Los Angeles diverting water from the Owens Valley. We learned that the water diversion had almost drained Owens Lake, destroying wildlife habitat and causing large dust storms in the area. As with Mono Lake, the courts got involved and ruled that Los Angeles had to take corrective action. Consequently, Owens Lake is maintained at a minimum level to eliminate dust storms and some of the habitat has been restored. The Manzanar National Historic Site was our next stop. 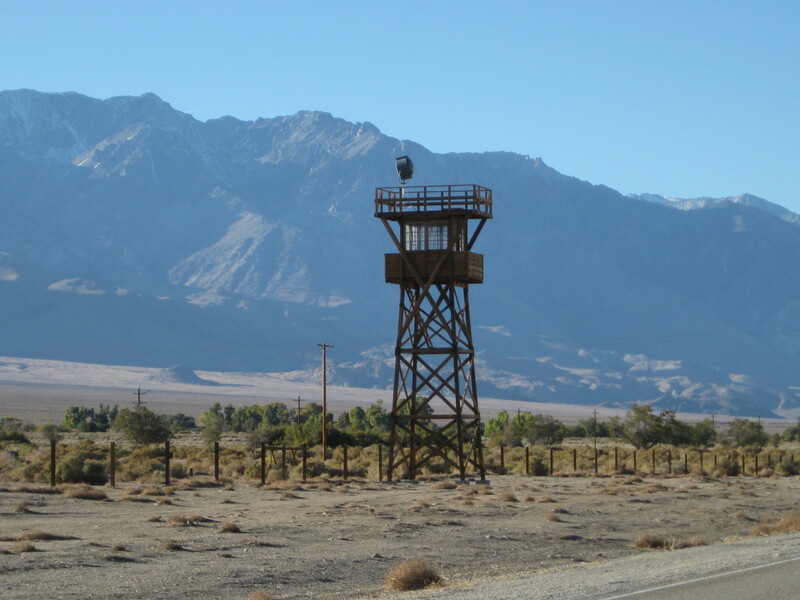 Manzanar was one of ten War Relocation Centers established to relocate Japanese Americans away from the coastal areas in the states of Washington, Oregon, and California. In February, 1942, President Roosevelt signed Executive Order 9066 and directed that 120,000 men, women, and children were taken from their homes. Most moved voluntarily, but some were actually arrested and sent into these Relocation Centers. 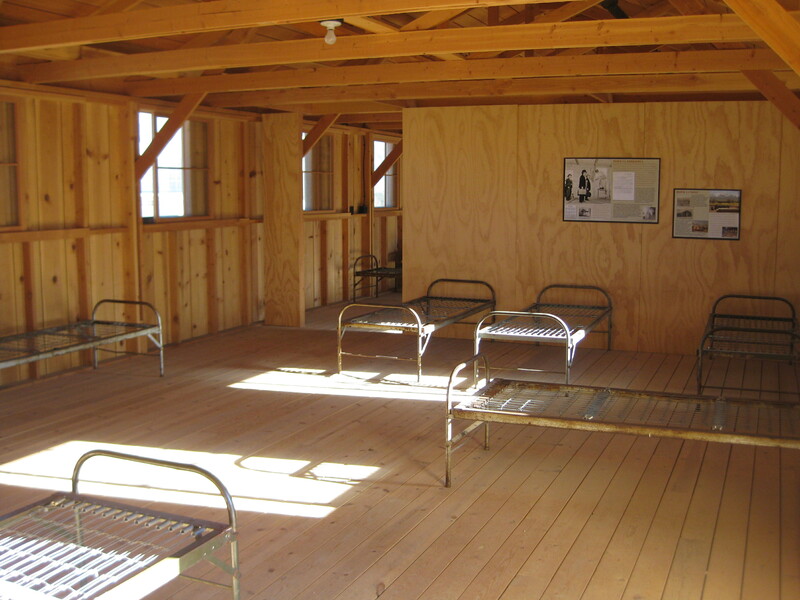 Manzanar was typical of these camps. They were quickly constructed and looked like prisoner of war camps, with barbed wire fences and guard towers. The internees, as they were called, were told the security was to protect them. They quickly noticed the lights and the guards were focused to the inside of camps, not the outside. 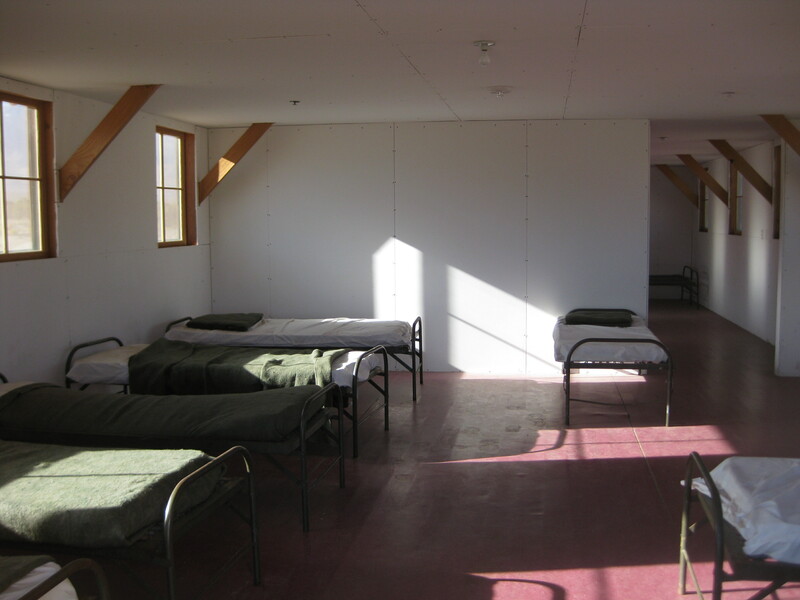 The 500-acre compound held 504 barracks that were divided into four rooms each. Any combination of eight individuals were allotted to each of these rooms, family integrity was not always possible. These rooms were furnished with an oil stove, a single hanging light bulb, steel cots with straw filled mattresses, and blankets. They endured temperatures of 1100 F in the summer and winter temperatures were often below freezing. The wind could blow right through the walls until improvements were finally made, mostly by the internees themselves. The internees planted their own crops and gardens, worked in the infrastructure of the camp, and in shops that made camouflage netting. In 1944, the military reinstated the draft for Japanese Americans or “Nisei.” Nisei soldiers served with distinction in the 100th Infantry Battalion and the 442nd Regimental Combat Team (RCT). PFC Sadao Munemori joined the Army one month prior to Pearl Harbor, but still his mother and siblings were interned at Manzanar. He served as a member of the 442nd RCT and was posthumously awarded the Congressional Medal of Honor when he threw himself on a grenade in Italy. Manzanar is a symbol of a sad time in our country’s history when we let fear trample all over the Bill of Rights. Let’s hope we never let this happen again. When we first pulled into our campsite, there was a smell of coolant coming from the engine compartment of the truck. Bob checked it out and couldn’t see any sign of a leak and the coolant level looked correct. He thought the filler cap may have been a bit loose so we decided to just keep an eye on it. When we returned from Manzanar, the smell of coolant was stronger and there was a drop in the coolant level. We decided we had to do something about it and did some online research to find a local shop where we could take it in the morning. Friday morning, Bob drove into Lone Pine and found the radiator was definitely leaking. He called GM Road Service because it was under warranty. They arranged to have it towed to the nearest GM dealer. Unfortunately the nearest GM facility was 150 miles away in Lancaster, CA. Bob went with the tow truck, prepared to stay overnight. Fortunately, the dealer ordered a new radiator when Bob called and they were able to repair the truck the next day. Bob got back around 7:00 pm on Saturday. Both of us figured there were better ways to spend our time than sitting around getting repairs done. Mt. Whitney was just a few miles behind our campground. At 14,497 feet, Mt. 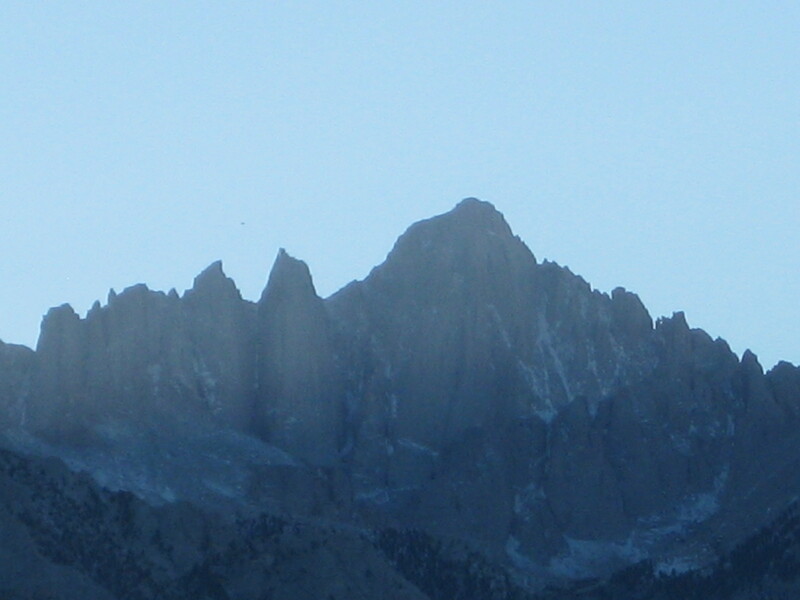 Whitney is the highest peak in the continental United States. 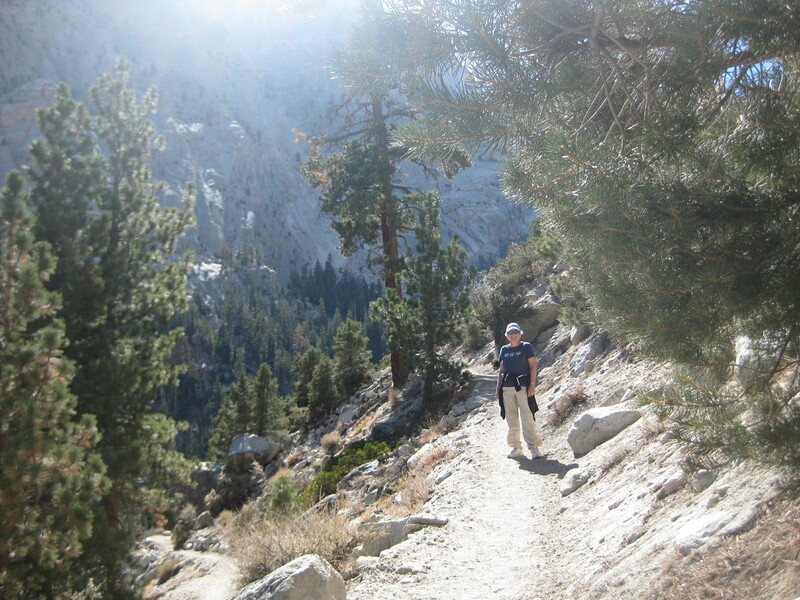 You can hike from the Whitney Portal trailhead along an 11-mile trail to the peak, but it is a change in elevation of 6,137 feet – not an easy hike! We hiked a short portion of the trail and had lunch at Whitney Portal. 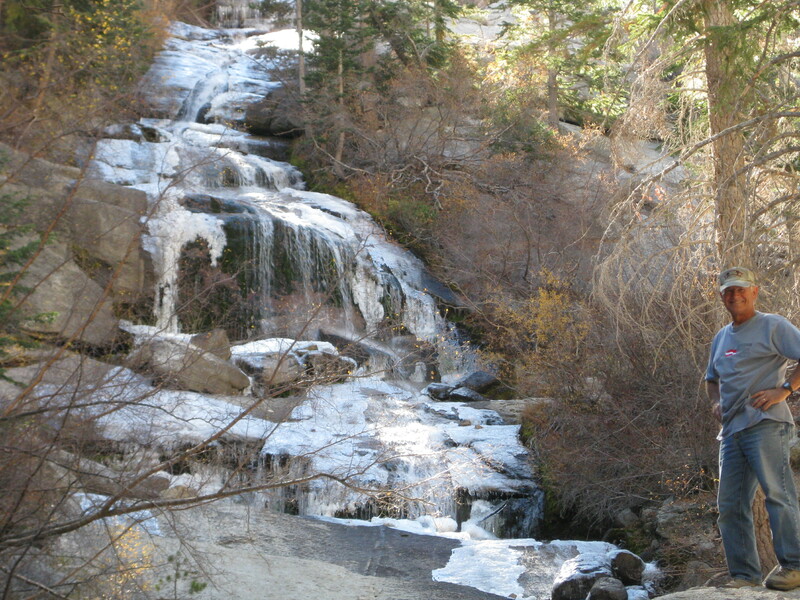 It was a beautiful day and we watched the water flowing down a partially frozen waterfall. There were ponds with ice on the surface and one of the hikers we talked to said there was six inches of ice on the pond at the peak. Tuesday we were up early and on our way to Hesperia where we planned to stay at the Desert Willow RV Resort to pamper ourselves after a couple of weeks of boondocking. This entry was posted in California, Fulltime RV, Michigan Traveler and tagged 442 Regimental Combat Team, Alabama Hills, fifth wheel trailer, full-time RV, fulltime RV, GMC Sierra, Lone Pine Film History Museum, Manzanar War Relocation Center, Mt. Whitney, Owens Valley, RV Forums. Bookmark the permalink.